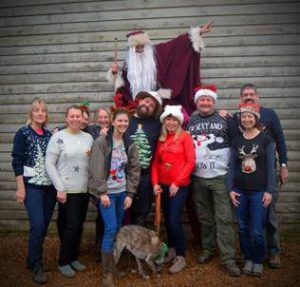 The crew running the Deepdale Christmas Market are immensely proud to announce that over £10,000 was raised for charity from the 10th annual event. 11 charities were supported with various activities over the weekend. St Mary’s Church Building Fund raised funds with their Christmas stall and café in the church. 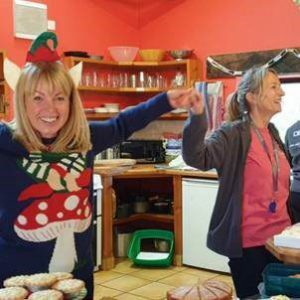 The Crew of Deepdale Backpackers & Camping ran a charity café in the kitchen of the backpackers hostel, raising funds for St Martin’s Housing Trust and The Peoples’ Picnic, both helping homeless people in the local area. Brancaster School and the Parents Association ran a tombola in St Mary’s Church on Saturday and Sunday. Their fundraising will benefit all the children attending the local school. Wells Community Hospital ran a tombola in St Mary’s Church on Friday, helping raise funds to supply local health care services. Norfolk Wildlife Trust had a stand talking to visitors about their reserves and selling membership. And new for this year we had three charities helping with the car parking in return for donations from car owners, the Benjamin Foundation (with help from West Norfolk Mind), the RNLI and Lions International (Hunstanton). 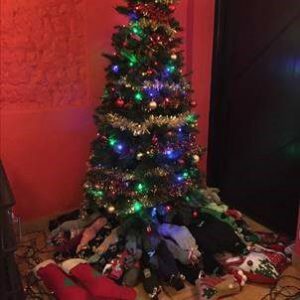 Over 100 filled socks were donated by visitors for The Peoples’ Picnic, who will be gifting them to homeless people in Norwich over Christmas. It’s not too late to donate yourself, and they are being collected in various places around the County. You can put them in the crate at BrewDog in Norwich or Tesco in Aylsham. 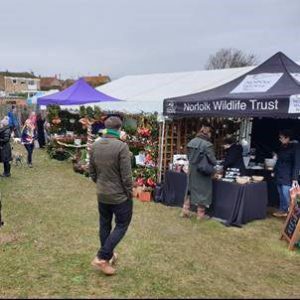 On top of all that charity fundraising, Dalegate Market and the rest of Burnham Deepdale celebrated Small Business Saturday by hosting over 130 local artisans and producers across the weekend. Tens of thousands of visitors enjoyed their Christmas shopping, and were entertained by local musicians and bands who played throughout the weekend. Not bad for a village with less than 30 permanent residents. Dalegate Market | Shopping & Cafe, Proudly powered by WordPress.